The Delta Wading Jacket is Sitka Gear's most versatile waterfowl jacket. The reinforced GORE-TEX® Pro Fabric is more breathable, durable, and quicker drying, while the streamlined pocket layout helps you keep it together in the field. 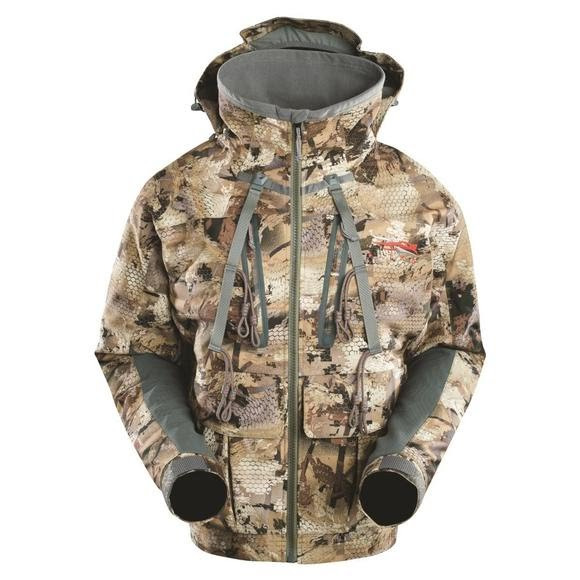 The Delta Wading Jacket is Sitka Gear&apos;s most versatile waterfowl jacket. The reinforced GORE-TEX® Pro Fabric is more breathable, durable, and quicker drying, while the streamlined pocket layout helps you keep it together in the field. Sitka waterproof breathable outer layers are originally treated with a Durable Water Repellant finish (DWR), which keeps the outer fabric from becoming saturated so that the breathable barrier can do its job. This coating needs to be replenished once per season, or more often if the piece gets a lot of use or washing. If water is no longer beading up on your shell, it&apos;s time to retreat it. Make sure to use a spray on our softshell pieces, and a wash-in for 2.5 layer garments, like the Downpour series. Additionally, don&apos;t hesitate to treat your Mountain Pants with a DWR spray and watch the water bead off. Garments engineered with GORE-TEX® fabrics are durably waterproof andwindproof and very breathable, guaranteed. They provide reliable weather protection and maximized comfort in all weather conditions. Excellent management of perspiration leads to optimized body heat regulation. No post activity chill. No cooling off due to wind chill. Each square inch of a GORE-TEX® membrane contains 9 billion pores. Each microscopic hole is 20,000 times smaller than a water droplet, making it impossible for rain, snow and sleet to pass through. While each pore of a GORE-TEX® membrane is smaller than a water droplet, each is 700 times larger than a water vapor molecule. This is what enables GORE-TEX® fabric to breathe so that sweat vapor can escape, keeping you dry from the inside, the ideal solution for hunters looking for broad weather protection and style. The Sitka delta wading jacket is a great piece for any hunter. It's very well built, lightweight, blocks the wind and is waterproof. I've had many other jackets and this is by far the most versatile and best I've owned. You can wear this early season with a T shirt and late season paired up with the Sitka duck oven and you'll be good to go. Great coat! Stops wind and rain. Also a awesome camo for hunting cornfields. I wear a size XL in most of my hunting jackets. Ordered this jacket in 3XL because Sitka normally runs smaller. i am 6'-1" 230lbs. I wanted to wear it as a shell over my heavier non waterproof coats. Coat size worked perfect for this application. If you are a little thinner I would go 2XL. this particular coat seems to run true to size.